Seven Benicia showpieces will open their doors and garden gates to the public on Saturday, May 7, 11 a.m. to 4 p.m., for the Benicia Historical Society’s home and garden tour. The Fischer-Hanlon House Garden will be open with refreshments. Four homes, a commercial building and two garden-only sites will welcome visitors during the tour. The four homes and the commercial site are more than 100 years old and offer a glimpse into Benicia’s rich architectural past. Examples of Craftsman and Italianate homes are among the architecture styles on the tour. “Three of them are on the tour for the first time,” said Jerry Hayes, tour chairman. Ticket holders will have a chance to see beautiful homes and gardens while raising money to help restore the Von Pfister General Store. The store was named to the National Register of Historic Places last year, and the historical society has big dreams for it. “We hope to restore and restock it as a general store, using Von Pfister’s original log as a guide for what to put on the shelves,” Hayes said. Gardens at several homes will be open to visit, plus two sites will be garden-only stops. The garden-only sites include one that was recently renovated in response to the drought. 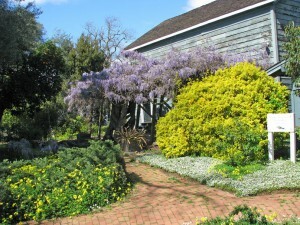 The second is the Fischer-Hanlon garden, where refreshments will be served amid the garden’s cacti, fruit trees and its 140-year-old wisteria. — The Ward/Sanford home, an Italianate that has been meticulously restored over the past decade. This is the first time it has been on the tour. — The Sage home, built originally in the 1850s from brick manufactured by Tim Sage. A wooden section was added later. The brick portion was torn down in the 1930s following a fire. — The Jenny cottage, which features a charming garden and is making its debut on the tour. — Also appearing for the first time is Capital Corner, the former saloon now office space. It also has been carefully restored. — The von Studnitz home, a Craftsman bungalow from 1915 that features built-in furnishings and several original lighting fixtures. Homes can be visited in any order. Docents will be available at each location to provide historical and architectural information and answer questions. Tickets are $25 in advance, $30 the day of the tour. Advance tickets are available at BeniciaHistoricalSociety.org, or at Benicia Chamber of Commerce, Benicia Main Street, Bookshop Benicia, Camellia Tea Room and Steve’s Hallmark in Benicia. On the day of the tour, tickets will be sold at Benicia Main Street, Camellia Tea Room and Capital Corner (602 West K St.), one of the tour sites. Participants are asked to wear soft-soled shoes (no heels, please). The tour is for adults only. Homes and gardens are not wheelchair-accessible. Backpacks, baby carriers and strollers are not permitted. No photography is allowed.